Geico‘s Gecko won the most popular icon at Yahoo’s Advertising Week in September after a long campaign by the insurance company and its advertising agency, The Martin Agency. Read on to find out more about the Geico Gecko campaign, launched in 1999 with the voice of Kelsey Grammar. Geico the green Gecko was launched on USA television in the 1999-2000 season. 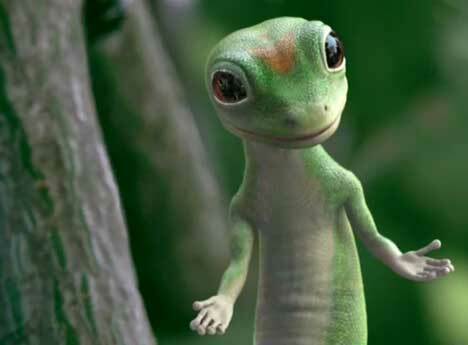 The first campaign featured the gecko, voiced by Kelsey Grammar, answering ‘wrong number’ calls from consumers looking for cheaper insurance from Geico. Without any explanation, the second series of Gecko ads presented the green reptile trying out as the new mascot of Geico. At the Geico audition the gecko met the former Taco Bell Chihuahua mascot who says, “Oh, great, a talking gecko”. Obviously the gecko gets the job. Creatives at the Martin Agency, Richmond, Virginia, came up with the campaign concept when they played with the common mispronunciation of the word, “Geico”. Why not make something of it. Geico became Gecko and with a few strokes of a pen the new character was brought to life. Five years later the Geico gecko graces every page of the company web site. He works for the fourth largest private passenger auto insurer in the United States, plays with beautiful women and gets rides on bikes, in cars, even in his own custom van. It’s something like the rise of Kermit the Frog. In 2004 Geico promoted their sponsorship of outdoor shows around the country with Geico’s custom van. The first two spots, aired in March, were titled “Getting Ready” and were followed with two “Driving” spots: “Extraordinary Events Demand An Extraordinary Individual” and “Four Legs. Eight Cylinders. Can You Say Road Trip”. Both spots conclude with the appearance of the GEICO Gecko saying, “Well, hello!” in an affable British accent. So where do you find the ads online? Geico in their video library feature Geico dancing the Robot and travelling to New York to kick off voting for the 2005 advertising icon of the year. Kelsey Grammar, of Frasier fame, provided the voice for the first ad. From there on the British accent was provided by Dave Kelly. For the most recent Geico Gecko campaign the accent is Cockney. There’s some debate about who the actor now is. I believe it would be impossible to pick the actor from the accent as a ‘voice’ can be developed to suit the demands. At Frametore, the animation/visual effects company responsible for the latest Geico look, there’s an explanation behind the new Cockney accent. The Geico Gecko campaign was developed at The Martin Agency, Richmond, VA by copywriter Steve Bassett, art director John Ryland, producer Brad Powell and assistant producer Emily Moore. Filming was shot by director/DP Sunny Zhao via Dreams Factory, Richmond, with producer Tim Dowdle and executive producer Clara Lee. Editor was Scott Witthaus at Greybox, Richmond. Music was composed by Bill Grishaw at 804, Richmond, with executive producer Kristin O’Connor. Colorist was Billy Gabor at Company 3, New York. Post production/VFX was done at Rhythm + Hues, Los Angeles, by online editor Mike D’Ambrosa, animation director Craig Talmy, digital supervisor Chris Romano, lighting director Debbie Pashkoff , Flame artists Yukiko Ishiwata and Tim Miller, executive producer Amy Hassler and producer Peggy Regan. Audio post production was done at Play, Santa Monica, by mixer John Bolen, with assistant mixers Matt Downs and Chris Hildrew.